PiYo Results: See the Amazing Before and After Photos! First of all, what is “PiYo“? The PiYo workout is an introductory/intermediate Beachbody On Demand program with Super Trainer Chalene Johnson. It takes concepts from Pilates and yoga and blends them into a cardio and strengthening program for higher-energy workouts. Pro tip: Get more detailed information about the program in the PiYo FAQ. But what about the PiYo results? There are so many Success Stories out there, so we picked just a handful to show how effective PiYo is for people of all ages and from all walks of life. I started out a tired wife and mama with a poor diet and no exercise routine. I was struggling to lose the last 10 to 12 pounds of baby weight and just did not have the energy to keep up with my two busy kiddos. I love yoga and Pilates, so PiYo was an ideal program for me. 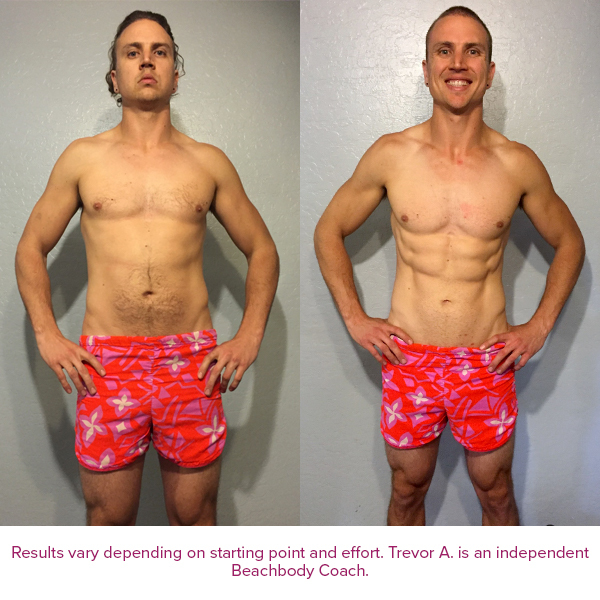 I have experienced so many incredible results with PiYo! I have lost ALL of the remaining baby weight plus a couple pounds and lots of inches. I have learned how to make eating right and exercising a priority, and I have realized how GOOD I feel when I stick with it. I drink Shakeology EVERY DAY. It gets me started on the right track and fills my nutritional gaps. I have more energy, mental clarity, and improved digestion. Yay for no more bloating! But what I have gained is even more important to me: confidence, energy to play with my kids, healthy eating habits for our entire family, and I just feel more “myself.” My family is getting the best version of me now. I was in terrible shape before PiYo. I hated my body. I was always tired and never had any energy to do anything. I could never hold a plank, much less do a single push-up. I can now do both with ease, thanks to PiYo. I feel great now! My energy has increased and I can keep up with my kiddos now. I love that I can wear a fitted shirt and not feel self-conscious. I was an athlete in my youth, so looking at myself in the mirror was most difficult. I was not sure how I could have let myself get so lost. I was very down on myself, because being 58 years old, I believed that it was too late for me to change anything about my appearance. I loved PiYo from the beginning. I followed the modifier in the beginning and was quickly able to move toward the more intense moves. Through this process, I’ve learned to love myself. I’ve been surrounded by like-minded, fit-minded people. I was very supported in the beginning because my self-esteem was pretty low. Low energy, low confidence, and low self-esteem definitely defined old me… but not the new me! 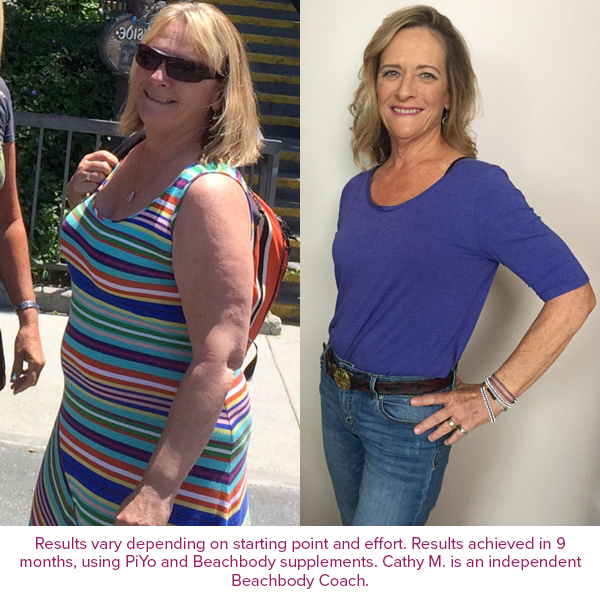 PiYo, Shakeology, and clean nutrition have changed me from the inside out! I was in OK shape. I felt OK, but I definitely had more potential. I loved the fact that PiYo is fun and challenging. The workouts were great — I didn’t know low-impact workouts were so effective. My body has completely transformed by using PiYo! I lost a bunch of weight, some in those very troublesome areas like my belly. Speaking of which — I have abs! I love how my core has transformed through PiYo. Drinking Shakeology helped me quit fast food and energy drinks. I definitely feel more focused and have more energy. I feel better than I have felt in a long time. After having my fourth baby, I was depressed about how pregnancy had left my body. Even though I was sad I was determined to do everything I could do to get back into shape. It was a struggle, but Shakeology and PiYo not only helped me get my body back but they helped me surpass my goal and get into the best shape of my life. I liked that it’s low-impact and that post-pregnancy I could still do most all of the exercises. I didn’t feel overwhelmed and I felt confident doing the moves. After doing PiYo, I vastly increased my core strength. I can hold planks and do core work I haven’t been able to do before. I’ve become addicted to fitness and taking care of myself. I know now that taking care of myself helps me be a better wife, mother, and person. In December 2015, I was extremely uncomfortable and out of shape. After a full day of chasing my three kids around, I was exhausted. I love that it focuses on stretching and strength training with your own body weight. Because PiYo is low-impact, it was easier for me to mentally push through a workout even when I didn’t think I could finish. I honestly feel like a whole new person. I am happy, healthy, and confident. I have learned to love myself for who I am and what I know I can become. I am so proud of my body! I was always down about myself because nothing fit and I couldn’t do anything without losing my breath. I couldn’t do the things that I wanted to do with my son. PiYo has done wonders for me. I feel so much better about myself, and I get so many compliments on my transformation. I fit into clothes now that I have never been able to wear! I can do anything with my little boy now and I couldn’t be happier about that. I’m in the best shape I have ever been. I am so happy with my results!